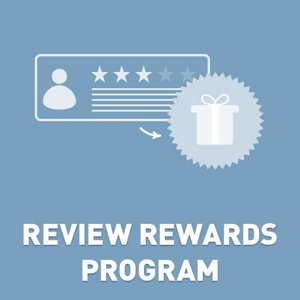 Review Rewards Program allows administrators to configure their nopCommerce installation to offer reward points for product reviews. Your customer will be interesting to write reviews because each their review takes him reward points. The author review will take rewards points only after approving. Another customers will read these reviews. This plugin will help you to increase your profit! The plugin allows you to configure the number of points to reward the author review. Included is the ability to display a special message in various widget zones on product pages, as well as an animated pop-up message to display on your home page. This allows you to tell customers about Review Reward Program. Plugin uses standard nopCommere review system. Admins can track the number of reviews to each product and to each author review (we added new tabs), and authors can track their own reviews and reward points from within their account. Not registered version is fully operational. It has only one limitation. Only 50 customers (reviews) will receive rewards points. Try before buying.